Join UNISDR on Facebook Become part of the disaster risk reduction and climate change adaptation conversation. General Assembly resolution 68/211 of 2013 established an Open-ended Intergovernmental Preparatory Committee to review organizational and substantive preparations for the Conference. The Preparatory Committee's first session (14-15 July 2014) agreed on a draft agenda and proposed rules of procedure for adoption by the Conference. A second session (17-18 November 2014) met to approve the Conference programme of work and develop the draft post-2015 framework for disaster risk reduction. 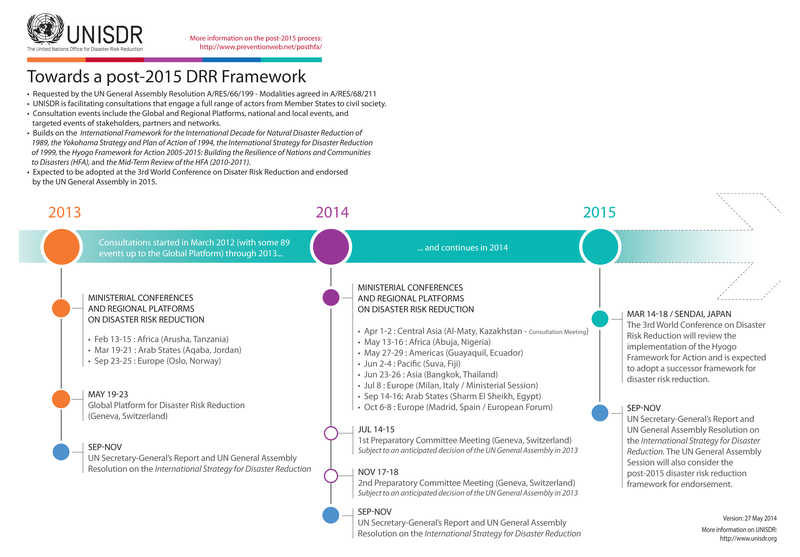 A third session, in Sendai, Japan (13 March 2015) will consider and transmit the draft post-2015 framework for disaster risk reduction to the World Conference. The Assembly established a Bureau of the Preparatory Committee to prepare sessions. General Assembly resolution 68/211 of 2013 “invites voluntary commitments by all stakeholders and their networks to implement the Hyogo Framework for Action as well as support the development of the post-2015 framework for disaster risk reduction”. The Assembly also decided, as one of the objectives of the WCDRR, "to identify modalities of cooperation based on commitments to implement a post-2015 framework for disaster risk reduction". In its resolution 69/207 of 2012, the General Assembly decided to convene the Third World Conference on Disaster Risk Reduction to review the implementation of the Hyogo Framework for Action and adopt a post-2015 framework for disaster risk reduction. UNISDR was requested to serve as Conference secretariat. It was tasked to facilitate the development of a post-2015 framework for disaster risk reduction and to coordinate preparatory activities in consultation with all relevant stakeholders. e. To determine modalities for periodic review of the implementation of a post-2015 framework for disaster risk reduction.